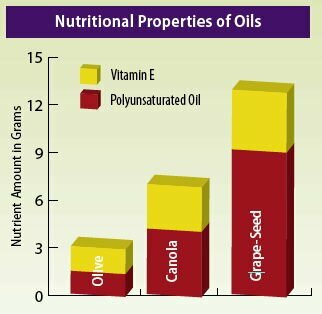 polyunsaturated oils, antioxidants, and other phytochemicals (as illustrated in the adjacent charts). Among the essential fatty acids needed by our bodies are linolenic (LNA) and linoleic (LA) acids—omega 3 and 6. These oils provide important nutrients for cellular function and vitality while also reducing harmful LDL cholesterol and boosting HDL, the “good” cholesterol. Additionally, research has shown that these oils may be effective in combating cell-damaging free radicals, which have been found to influence aging and a variety of ailments. These beneficial and healthful properties make grape-seed oil attractive to those who are not only discerning in their tastes but also health conscious, placing priority on minimizing their consumption of saturated fats while increasing the nutritional value of their diets. 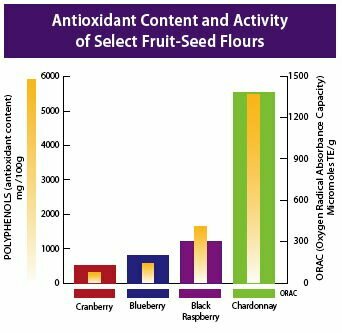 have about 5- to 10-times the antioxidant content and activity of flours from other fruit seeds (refer to chart). Breads, pastries, pastas, and other food items made with these gluten-free, grape-seed flours (added at 5% to 10% by weight, or 1 to 2 tablespoons of grape-seed flour per cup of dry ingredients) typically contain 3,000- to 5,000-times the antioxidants of bread and other baked goods prepared with standard ingredients. A growing body of evidence suggests that consuming these oil and flour derivatives from grape seeds can improve overall health and longevity.